DETROIT — It takes a great deal of awareness to identify the moment when a fanciful notion becomes a blatant untruth, and from there, perhaps a destructive ideology. It might be easier if these notions took a physical form, one that could hang in space as a visual metaphor. 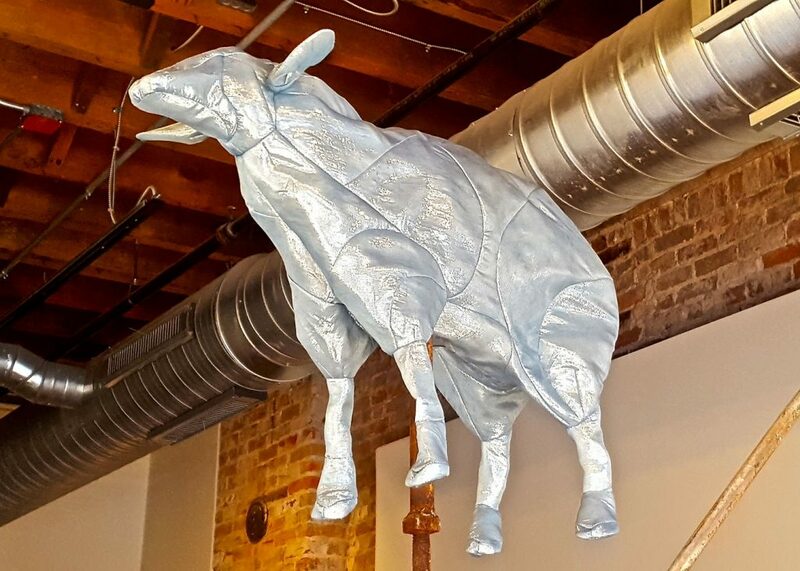 For a recent solo show at K. Oss Gallery, Whether Ewe Like it or Not, sculptor and installation artist Sarah Wagner chose a sheep for this purpose. According to Wagner’s research, 16th-century Europeans explained the appearance of cotton in its natural state (quite an exotic commodity, at the time) with the idea that sheep grow on trees, leaving behind little snippets in the vegetation. This idea took popular hold, until it was debunked by the book The Vegetable Lamb of Tartary in the late 19th century. Wagner has adopted the notion of the sheep tree as a sort of mascot for pervasive falsehood — specifically romanticized or elided stories that Americans tell themselves about the forces that built the United States into a world power. Cotton was fundamental to the initial wealth-building of the burgeoning nation, and some of its crucial innovations — devalued (enslaved) labor, the cotton gin — created key precedent for the ravages of the US as an industrialized nation, in the next extension of its wealth and power.